Reserving a mini party bus Chicago could be on your mind if you're hosting a small get together or if you have to work with a budget when it comes to your transportation. We might not have the smallest party buses in the area, but we do have some fantastic options that are suitable for any group. With our affordable pricing structure, you don't have to worry about finding the smallest vehicle and hope for the lowest price. The appeal of a mini party bus Chicago is present in all of our quality buses, so be sure to take a look through our vehicle selection to find the right choice for your celebration. We often get calls for a mini party bus Chicago when residents and visitors are planning a sight seeing tour or checking out a concert. With concert venues like the Vic Theatre, Riviera Theatre, Park West, United Center, Copernicus Center, Soldier Field, and more...there are ample opportunities to catch a big name in the Windy City. If indie music is more of your scene, you'll find it everywhere at lounges and bars around town. Whether you're a fan of hip hop, rock, blues, or techno, there's a scene waiting for you to check it out in one of our vehicles. If you do plan on embarking on a tour of all of the popular places in Chicago, we've got you covered. We've been to all of the hidden gems and popular destinations, so we can give you a well rounded tour if you need suggestions for your trip. We're just fine with taking the passenger seat (so to speak) to allow you to completely customize the trip to your liking, as well. Our flexible customer service and attention to detail allows you to experience your trip in a way that you see fit. No uncomfortable or forced conversation necessary if you'd just like to chill out and enjoy sights like Navy Pier, Millennium Park, Willis Tower, and Lake Michigan. With all of the destinations and events that happen in the area, everybody has a chance to take part in something that interests them. 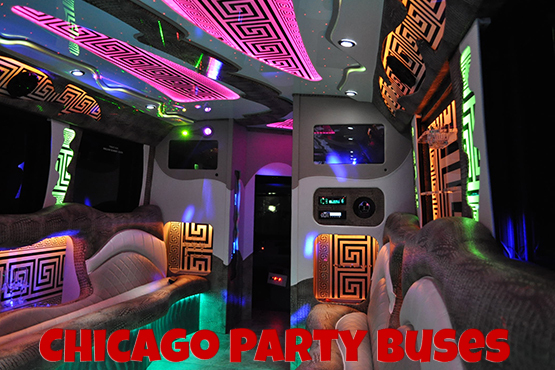 There are various benefits to using a party bus in Chicago and beyond to surrounding cities. Whether you are new to the city or you're native, you know that traffic can be a bit intense, especially downtown. With this task put into the hands of a professional, you can be completely confident knowing that you will get to where you need to be on time. If you've never used a transportation rental before, you will be surprised in how much of a difference it makes for your experience! There's a reason why most of our customers are considered to be repeat business. You can join the crowd of satisfied party bus renters by giving us a call when you have a chance to give us details about the event that you're planning. We will set you up with the perfect size vehicle for your group.